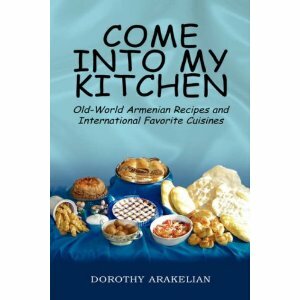 TheArmenianKitchen.com : Bokon recipe found? 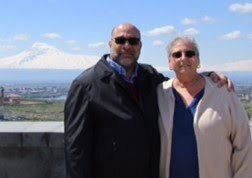 In my search for Devyn Egigian’s request for Bokon, an Armenian bread said to be thicker than lavash, I consulted with Dorothy Arakelian who said the description sounded like her recipe for “Arabkirsee Gagulth Hatz”, a soft, spongy bread that’s served with cheese. 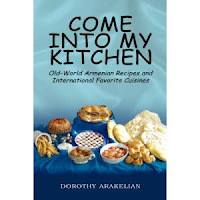 This recipe comes from her cookbook “Come Into My Kitchen” which can be purchased through http://www.amazon.com/ (scroll down to see our link to amazon.com below). 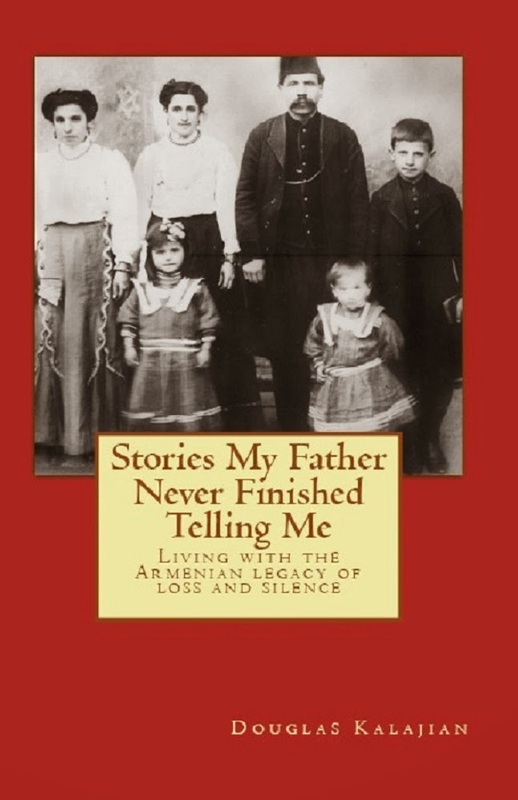 A picture of the large, flat loaves of bread can be seen on the right-hand side of the book’s cover. To try this, and the rest of Dorothy’s delicious recipes, I urge you to treat yourself to a copy of her cookbook without delay. I thoroughly enjoy mine! Dorothy’s recipe for Arabkirsee Gagulth Hatz follows. For the record, Dorothy explains “gagulth” is pronounced ”gug gough”. This recipe will yield 6 loaves, which will freeze well. Place yeast in a small cup with sugar; add ½ cup of very warm water and stir to dissolve. Set aside to proof. Using a large mixing bowl, combine all of the dough ingredients with a large spoon, and gradually start to knead with your hands until the dough is smooth, soft, and elastic. Cover dough with plastic wrap, and a heavy towel. Place in a draft-free area to rise for about one hour or until doubled. Sprinkle flour very lightly on the counter top; divide dough into 6 large balls about the size of a large grapefruit. Cover dough with plastic wrap for about 1/2 hour. Using a regular rolling pin, roll each ball into an oval shape, about 4 to 5 inches in length. Gradually lengthen the oval by flipping the dough over the side of your hand until the oval stretches to about 12 inches long and about ½ inch thick. Place ovals on ungreased baking sheets, brush tops with egg wash, and bake on the middle rack of the oven for about 12 to 15 minutes, or until puffy and light tan. OK Devyn, it's your job to test this recipe to see how it compares to the bread your grandfather used to buy. We eagerly await your opinion! Any recipe that starts with "5 lbs AP flour" has got to be wonderful fun! I am going to bookmark this so I can play during my next vacation. Okay, Robyn, I gave it a try, and while the bread was wonderful, it wasn't bokon. :( The top was quite close to bokon, but the inside wasn't. I think it needs to be a little closer to the crumb of foccacia, without its olive oiliness. Matnakash was mentioned... does anyone have a wonderful recipe for that I might try to see if that's closer? Thanks for checking, SK! A recipe for matnakash will be posted very soon. Glad to be of assistance, Devyn. After making the matnakash, you must tell us if this is your lost bread. Have you ever heard of Pacharch? My gramma used to make it for us ages ago. Basically a large bread type base with garlicky madzoon served in the middle I think. Very tasty! (some recipes call for a filling; some don't). But pacharch with a garlicky madzoon center is one I do not know. Sorry.